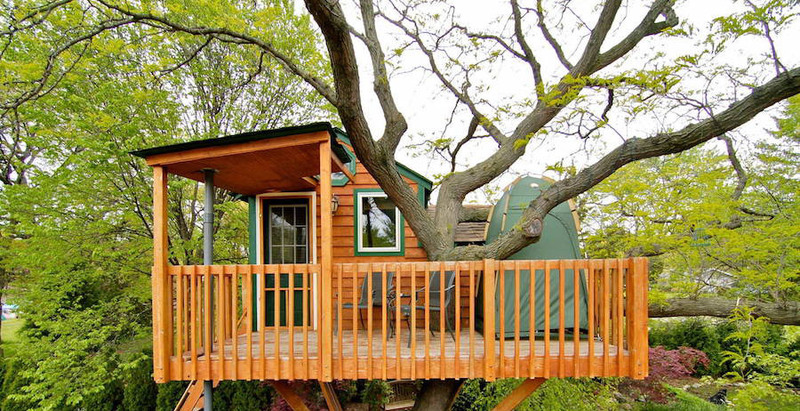 A tiny garden guest treehouse in Schaumburg, Illinois. More info. 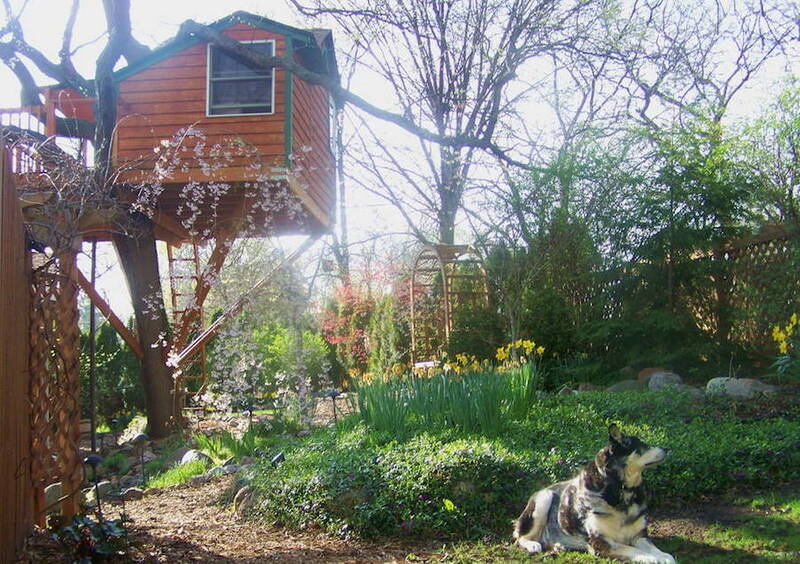 Garden Treehouse. Wouldn’t the DVD player melt on top of the fireplace?? Uhh… there is no chimney! Must not be a real fireplace… It probably heats via a heating element. Also, if it was a real fireplace, there wouldn’t be a smoke detector on the ceiling above it, as they also detect rapid temperature changes and would be immediately triggered by a fire. Uhhh… I come from the tropics! Not everyone is in the know about heaters. No need to be such a knob about it. Allow, me to rephrase then, wouldn’t the DVD player melt on top of the fake fireplace/ heater? If it doesn’t heat then why waste the space? It’s a fake fireplace that has an electric heater in it. If you look at the bottom of the fireplace it has a small electric heater that vents heat into the room. The “fire” is just for ambiance. Something pretty to look at. It’s essentially a space heater. I assume since this tree isn’t going anywhere, that this structure is fixed and is wired into city electricity, so a power hog space heater wouldn’t be an issue in that regard. Why does his answer make him a knob? He was just giving you the response you asked for. Nothing I read was even remotely knobish or rude. I think maybe you could be the knob with your rude response. 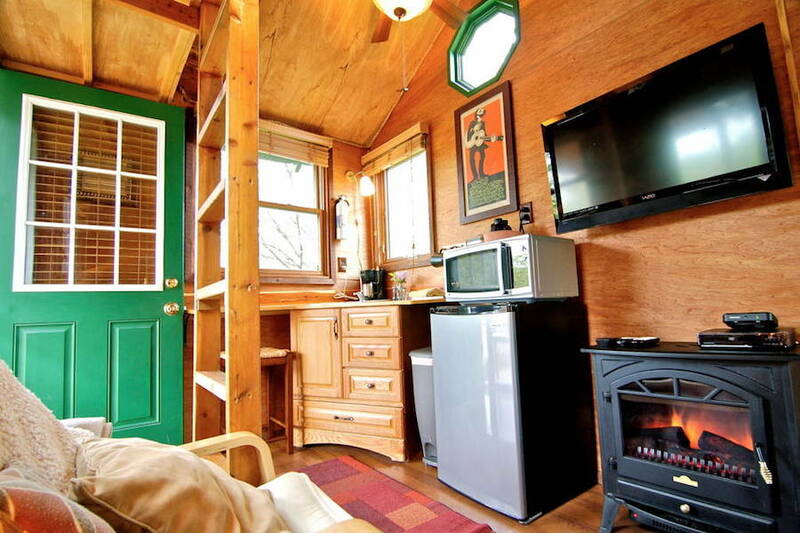 It must be the same as my electric fireplace…it just blows hot air out the front….the top stays cool enough to put a tv on it. 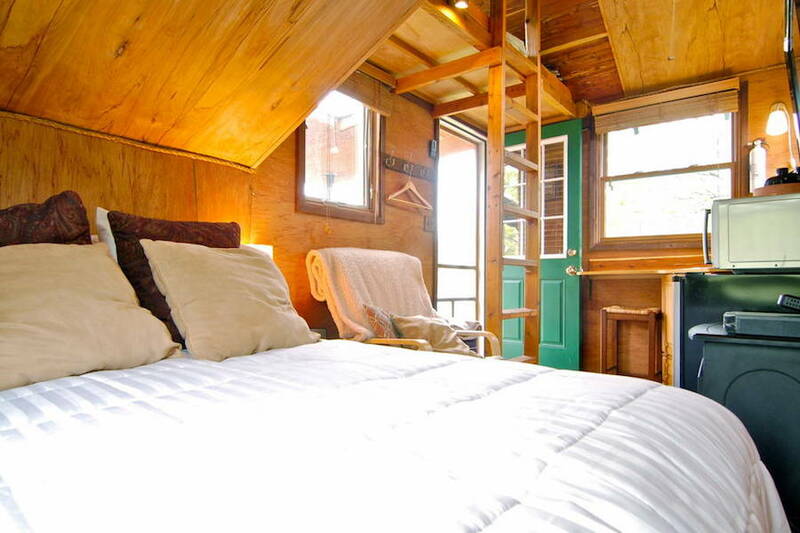 when did tinyhouseswoon.com become a place for trolling and people being rude to each other? It’s lovely. Do you live in it or is it just a guest house? Yes that is an electric heater stays cool on top but warms the room nicely. Looks like it could be a infrared heater. Heat only come out the front. If it supported your weight, you could totally sit on one and not get burned from the top of it. 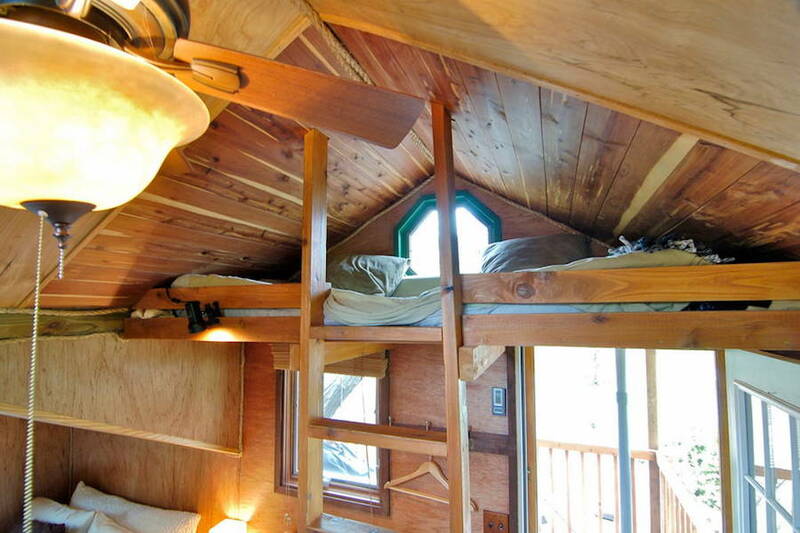 Also, this is definitely a guest house type of situation. It’s pretty bare bones otherwise. 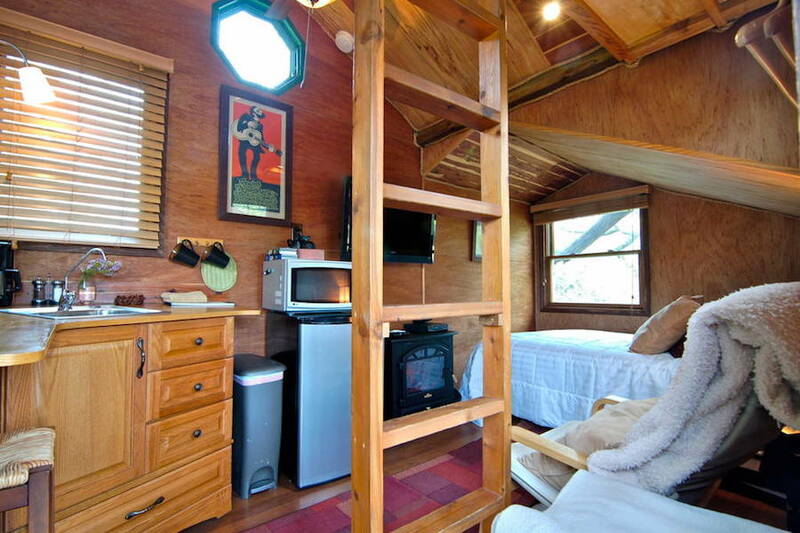 I doubt someone would be that minimalist and still have a microwave, fridge and tv/dvd, etc…. 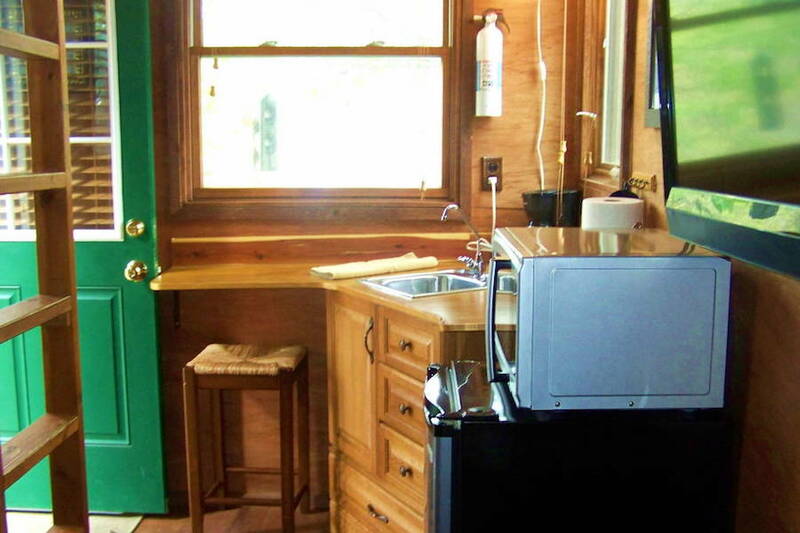 There’s no real cooking space or means to cook other than micro. which is probably for popcorn and hot drinks.